The girls are just over four weeks now and they’re getting a little too big for the bunny cage. 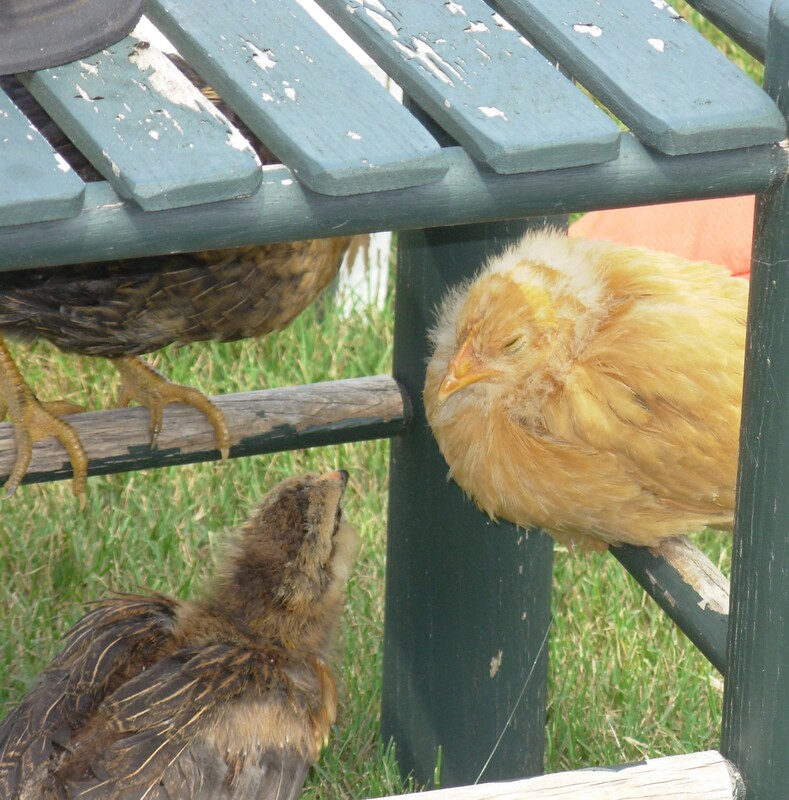 They still sleep in it at night on the screened porch, but every morning I put the top part of the cage on the grass. This way they’re still enclosed, but they have fresh grass to scratch and peck in. 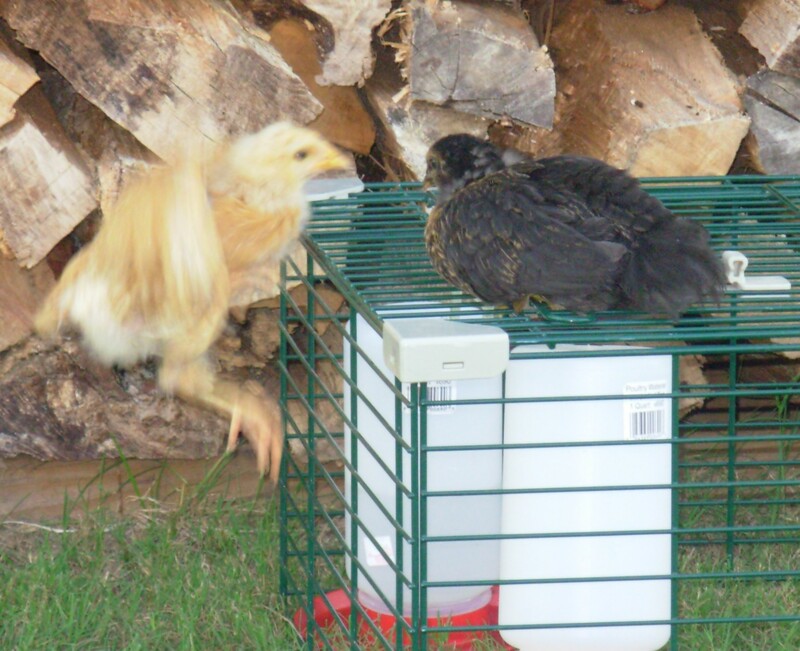 At least twice a day I let them free range in the yard with the kittens safely locked on the porch so they can stretch their wings and get some fun exercise. I open the door and they all run out single file with Violet usually in the lead. They run around in large circles for a while and then they re-enact a scene from The Matrix. Violet fancies herself in the role of Neo played woodenly by Mr. Keanu Reeves. She flies up in the air and meets one of her sisters in brief but deadly mid-air skirmish. Well, it’s more hilarious than deadly. It really reminds me of those macho chest bumps you see in baseball when they make a touchdown or goal or whatever. I’m not really into sports that much. 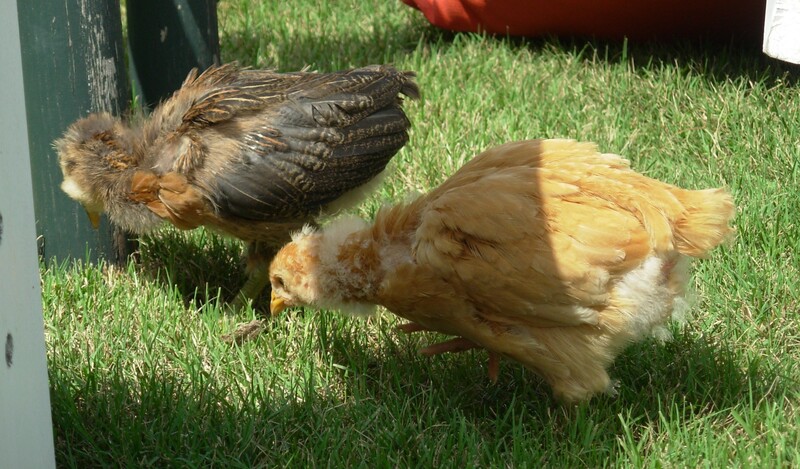 After the play fighting is over they run around the yard in a tight little chicken gang looking for adventure and bugs. I’ve seen them eat grass, dirt and the occasional insect. Today I saw my “special” little bird, Daisy catch a fly with her beak! Snooze you lose Violet! I can usually catch Violet easily and she lets me hold her and walk around the yard. I read that handling them a lot makes them tame and eventually some chickens will actually jump in your lap for a snuggle. Violet is very calm and she makes little cooing sounds when I tell her how pretty and smart she is. Finally I put her on my shoulder and she flies off landing gracefully beside her sisters. Rosie and Daisy don’t like being held very much but I still give them mandatory love a few times a week. Jim has begun construction on the portable chicken condo. He’s using the basic blueprint for the CHICKEN ARK http://handcraftedcoops.com/ but he’s modifying it somewhat to make it look more like Casa de Burlingame. Instead of a wooden slat roof he’s using tin and I’m going to paint it red and white and put a little chicken weather vane on top. All the other chickens will be so jealous! If you know my husband Jim, you know that he has many fine qualities but “fastness” is not one of them. He promises me that my girls will have a home by this Sunday but if that actually happens, please be on the lookout for flying pigs! 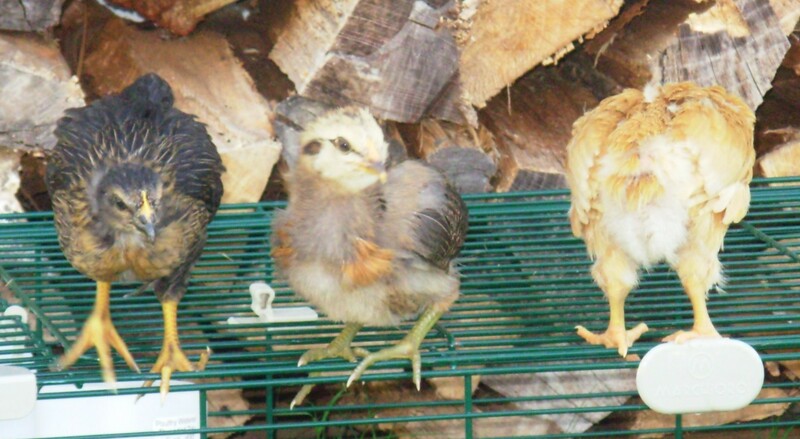 Life before chickens….how dull. I’m beginning to really love these little girls. Their ‘mama’ is pretty awesome, too. Right back at ya Aunt Carol! Hey, you have a PERFECT back yard for chickens! Wouldn’t Roxy love to watch them? Hugs to my two favorite relations!